I am an educator and performer who believes in the power of music to enrich our lives, I teach levels beginner to advanced, and bring over 18 years of musical experience to your lessons. Liz Ramirez is a New York City native clarinetist and passionate educator with over eighteen years performing experience and a over twelve years of teaching experience. She has a passion for teaching and believes in the power of music in creating well rounded human beings and being a vehicle for changing the world for the better. Liz has taught students from diverse backgrounds ranging in ages 6-65. 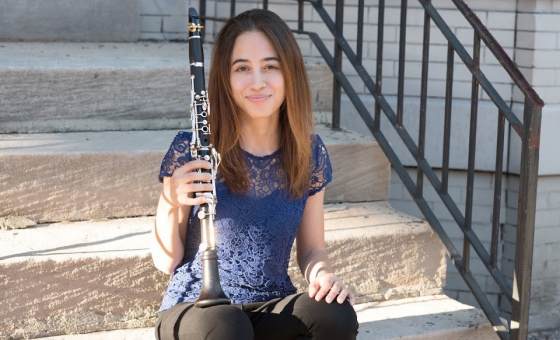 Liz's students have been accepted to the Juilliard Music Advancement Program, LaGuardia High School of Music and Art and Performing Arts, various Summer music festivals, and they have also consistently received top placement in Solo and Ensemble and All State auditions. Liz is an active freelance musician, and is a member of the Symphony Orchestra of the Americas, One World Symphony, and Banda Nueva York. She has performed with many ensembles including the Milwaukee Symphony Orchestra, and has played in many top concert halls including New York’s Carnegie Hall, Lincoln Center, Symphony Space and halls abroad in Scotland, England, Spain and China. As a recording artist Liz can be heard on Spotify, Naxos and several award-winning films. She received her bachelors degree from the Peabody Institute of the Johns Hopkins University, and her masters at the Peck School of the Arts at the University of Wisconsin-Milwaukee. Most recently, Liz completed the masters level certificate Global Leaders Program of the Youth Orchestra of the Americans, in partnership with Oxford, McGill University, and the Fulbright Association. My approach to lessons is very personal. I like to get to know my students so that I can better understand what will work best for them. Music is a wonderful tool that allows us to get to know ourselves better and to grow as human beings. It is also one of the strongest unifiers and community builders. One of the most rewarding experiences for me as a teacher is to witness how music allows students to blossom in their willingness to take on challenges, which builds their self confidence. These are just a few of many rewards, all of which can be applied to our daily lives. I am willing to accommodate days/times outside my listed availability. Please message me. Building a strong foundation with fundamentals- tone development, air, proper posture and hand position, scales, etudes, duets etc. Any material the student wants to learn/work on- learn how to play your favorite pop tune, prepare some tunes for the Holidays, learn a piece from the standard repertoire, master those band/orchestra parts etc. Audition prep- I have taken many auditions over the years including auditions for major symphony orchestras, specialized arts high schools, concerto competitions, chamber music competitions, Summer music festivals, preparatory music programs. I would love to share my knowledge and experiences with auditions to help you achieve your goals.